Vera Klement was born to Russian Jewish immigrants in The Free City of Danzig (today, Gdansk, Poland) in 1929. She was uprooted from a tranquil childhood by the Baltic Sea when her family fled Nazi persecution and moved to New York City. Klement studied at the Cooper Union School of Art and Architecture, graduating in 1950. She began her career at the height of New York Abstract Expressionism—a movement that significantly influenced her work. Upon relocating to Chicago in 1964, she joined The Rebellious Five, a group that exhibited immense abstract paintings in downtown Chicago lobbies. For the practical reason of accommodating her gigantic compositions, Klement bolted various panels together to create a single work. 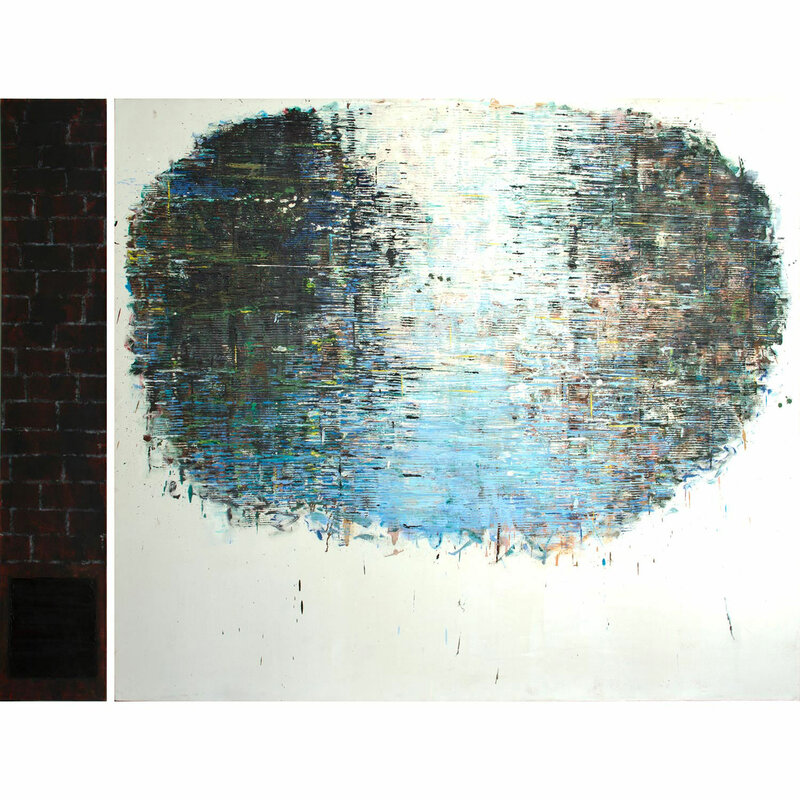 Multiple panels, juxtaposed for their expressive potential, have since become a signature of her work. The title of this work, Plus and Minus, refers to the Dutch painter Piet Mondrian’s “Plus and Minus” series of 1914-1917, in which he reduced his observations of natural elements such as sea, sky, and stars to a pattern of vertical and horizontal lines in an oval formation. The impressionistic palette of blues and greens, and the shimmering effect—produced by the thick application of paint with a corrugated material—allude to Monet’s paintings of his garden ponds at Giverny. For Klement, this ideal landscape, set against a pristine white ground, represents paradise lost and is a wistful allusion to the idyllic surroundings of her youth. The second panel shows a brick wall, which for Klement evokes ghetto barricades and crematoria chimneys. This tandem work represents the human constructions that block and contain, limiting and destroying possibilities and rendering paradise unobtainable. Sometimes called the “grand doyenne” of the Chicago art scene, Klement had a long teaching career at the University of Chicago and continues to paint from her South Loop studio-home. November 2013, marking the addition of one of her monumental paintings to Spertus Institute for Jewish Learning and Leadership. The work — titled "Plus and Minus: Homage to Mondrian’s painting of the same name" — was painted in 1994 and donated in 2013 to Spertus Institute by Jeffrey Stevens. The interview took place in Ms. Klement's Chicago home/studio. Dimensions: 72 1/16 in.x 96 9/16 in.